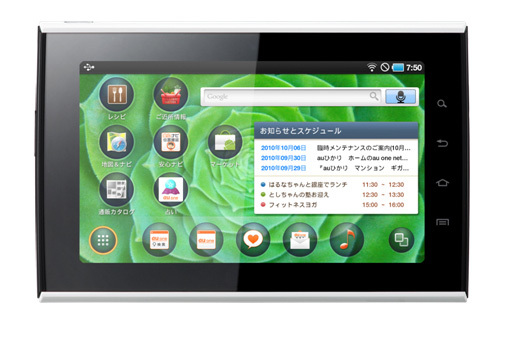 Japanese mobile operator KDDI has announced a new tablet, which is made by Samsung and is called SMT-i9100. You might be think that this is a Galaxy Tab, with different codename, but you’re wrong. Тhe SMT-i9100 measures 199 x 129.5 x 13.9 mm, weight 450g and also has a 7-inch 1024 x 600 capacitive multi-touch display, but looks different and have different specs. 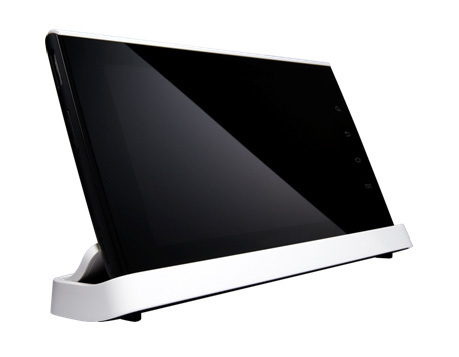 The tablet packs 512MB RAM, 4GB of storage, a 802.11 b/g/n WiFi, Bluetooth 2.1, a microSD slot, mini USB, only front facing a 2 megapixel camera and two 1W built-in speakers. It runs Android 2.2 with Ocean Observation UI instead of TouchWiz and offers only a 2 hour battery life?! The SMT-i9100 tablet is expected to be available in February next year.